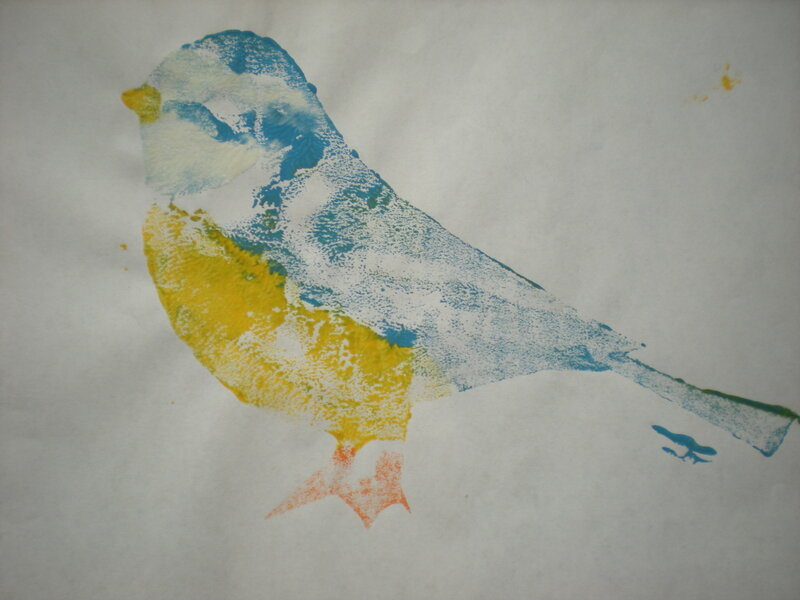 I love prints of all kinds; and the print making process. Looking at various artists work I enjoy seeing how different colourways of the same set of lines and shapes affect the look of the finished image. I like monochrome and colours- simple and detailed, all sorts of print and processes. From a more philosophical point of view I think I’m drawn to the suddenness of it, the irrevocable mark. No matter how long it takes to conceive of the block- and the time it takes to create it- once the ink or paint is on, there is that “bam” moment (ok , sometimes more than one, I know). But the thing is it is done. Children love it too; and I love the “Oh look! Another one – another one -and-another one….” Realisation that they can make the mark they have created over and over again. Magic! While drawing is sometimes hard to feel happy with- printing is such a simple joy. bam bam bam. Look what I can do! 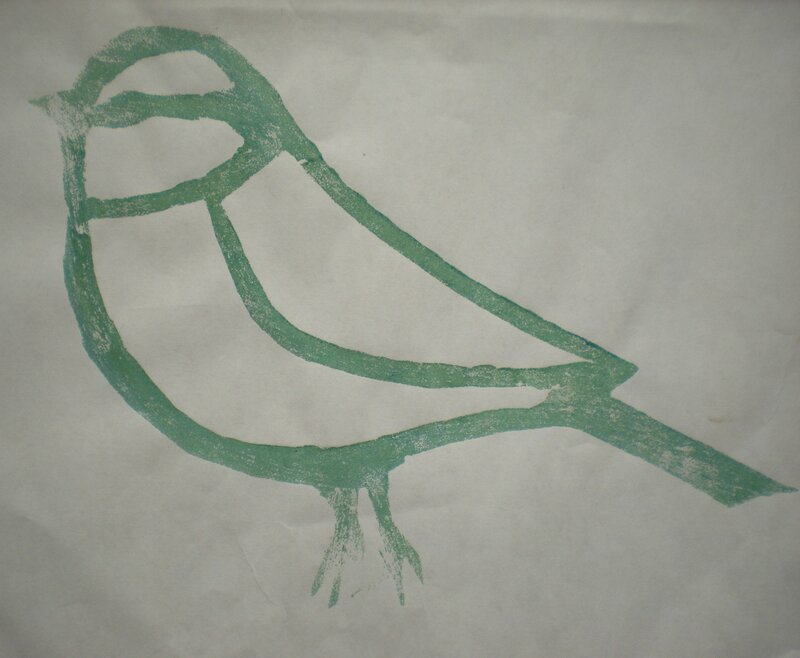 After an unfortunate incident with linocutting during ‘A level’ art, I went off printmaking for years. So most of my printing has been on this simple level; with children as the excuse to do it. Lots of “this is a sample “efforts that I secretly want to keep- even if it they are in poster paint. I made them when we had no photocopier at the environment centre- people were always asking for colouring pages. So I printed these with paint, for them to colour in. They are made with cut out sticky-backed foam, on cardboard. The foam was (I think) a kind of gasket; an unusable / left over industrial product from a scrapstore. I just cut out the shape directly into it with scissors as it is quite thin. ( Good job it too, because I was later challenged to produce a helicopter and a footballer! ) It is very useful! 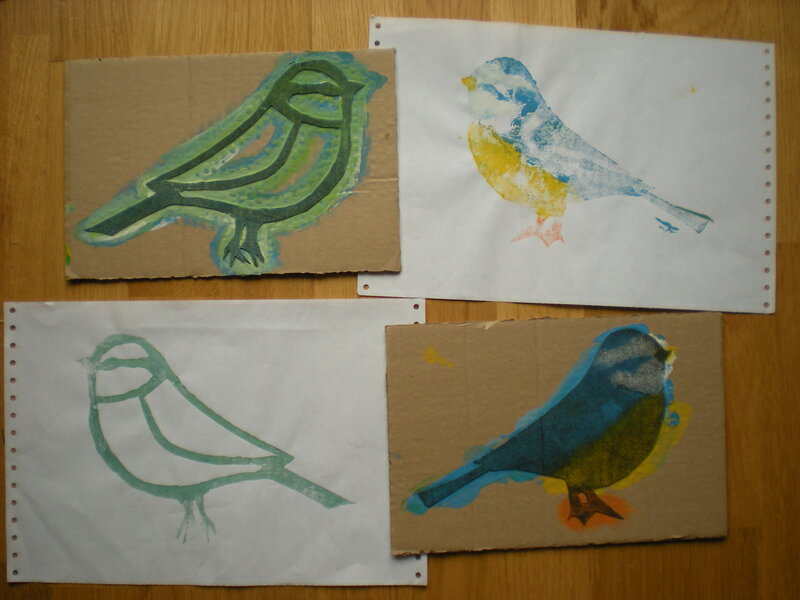 Then I made these when the actual printing was so appealing they wanted to have a go! 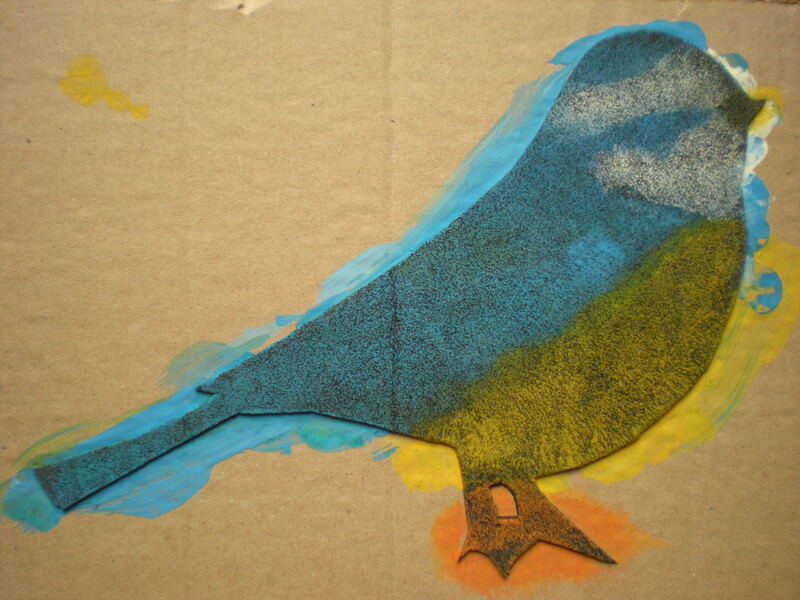 We did birds, trees, birds in trees… great fun. Later on, on “Apple Day” we printed apple pictures with real apples ( only the ones we could not eat because they were unripe etc. ). More about this when I have some pictures from Apple Day at the reserve, later this month. Which brings me to a handy tip for those of you who are uncertain about the paint/ children/ home furnishings combo, and clearing up. 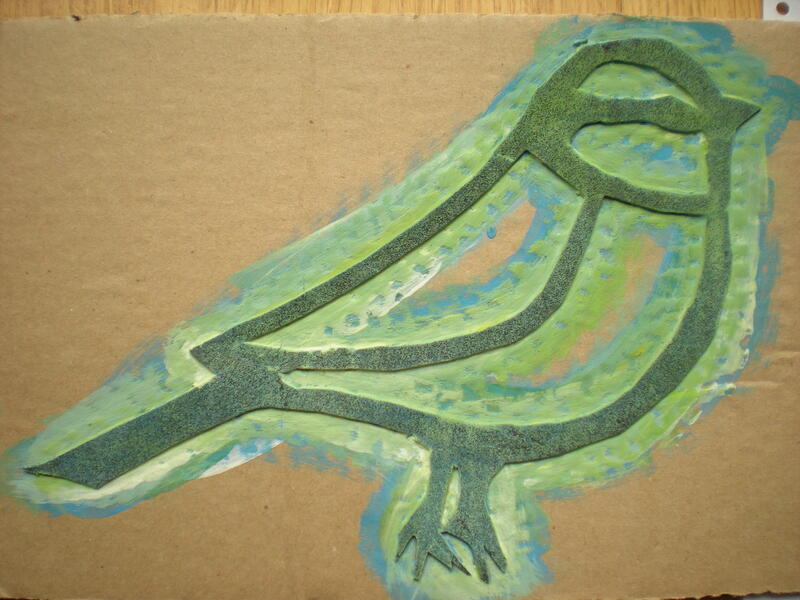 You put the very slightly thinned paint ( ordinary poster/school paint ) onto a *plate and cover it with a thin sheet of sponge foam ( mine is from motherboard packing boxes) . You hold down the sponge with a grid of sellotape or elastic bands across the edges; so it stays put. This can then be used as a giant printing pad or with brushes instead of a paint pot. I will get some pictures of this – it sounds more trouble then it looks. I’ve had a table set out with these for a whole weekend “drop in” event- and hardly ANY cleaning up! *You can use ceramic plates or even paper disposable ones if it is for a one off event ( but you need to make sure these don’t get too soggy ). If you cover them with cling film between sessions they will last for a few days too! and no excuses for me to do some printing, thanks for the encouragement Chantal.